Creating accessible Word documents is very similar to creating accessible html documents, so if you know how to create one, you have a leg up on creating the other! Sighted people are able to skim a web page by picking out the big, bold headings on a page. Screen reader users can also pick out important headings if they are formatted correctly. One of the most important accessibility features in Word is to create proper headings-in the proper hierarchy. It’s easy to do in Word. Select the text that should be formatted. On the Home ribbon, in your Styles palette, choose a heading. In this instance, Heading 1 was chosen for the main page title. A Heading 1 is the main page title. It is the most important heading, and there should be just one. Heading 1 is normally in the largest font in the document. A Heading 3 is a sub-section of Heading 2 content, smaller than Heading 2, and so on (Think of headings in terms of an outline). Lower-degree headings should be contained within headings of the next highest degree; you should not skip heading levels, such as using a Heading 4 directly below Heading 2 content. If you want to edit the style of the heading, for instance using a bolder or bigger font, right-click (or Shift+F10) on the heading in the Styles section of the Home ribbon and choose Modify. In the following dialog box, you can choose the font (in this instance Arial Black), font size, color and other style variables (first outlined box in following diagram). If you want these same styles every time you create a new document, choose New documents based on this template (second outlined box). Right-click (or Shift+F10) an image. Select Format Picture, then the Layout & Properties icon. 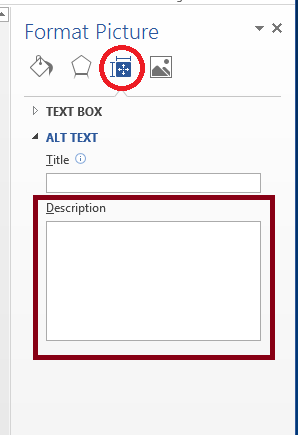 Enter appropriate alt text (description of image) only in the Description field (not the Title field). If you need columns in your document, always use true columns- not columns created by hand with the Tab key, etc. Choose the Layout tab in the ribbon. Select text that you want numbered or bulleted. If you paste a full URL into a document, Word will automatically create a hyperlink. The text of a URL may not make sense to a screen reader user. The Rod Library website has historical information about buildings at UNI. Select the meaningful text you want linked, Right-click (or Shift+F10) and choose Hyperlink. Make sure the text in the Text to display field is a meaningful description. Type (or copy and paste) the link URL in the Address field. Do NOT use tables for layout. Only use tables to present data. For data tables to be accessible to a screen reader user, they need a clear table structure and table headers. Under the Insert tab, select Table: Insert Table. Do NOT use the Draw Table option. Select the first (header) row of the table. Right-click (or Shift+F10) for the context menu and choose Table Properties. Choose the Row tab. Select (check) the option Repeat as a header row at the top of each page. Go to File:Info. In the list on the right side, choose Properties: Advanced Properties. In the Advanced Properties window, under the Summary tab, enter a title. The Accessibility Checker task pane will show accessibility errors, warnings, and tips on how to repair the errors. Select specific issues to see Additional Information at the bottom of the task pane. Make sure you are using foreground and background colors that have enough contrast. Black text on white is good contrast; red on green is poor contrast. You can download a color contrast tool to help you decide which colors have enough contrast together. Don’t use color as the only means to convey content. People with color blindness may not be able to ascertain certain colors. For instance, as many as 8 percent of men and 0.5 percent of women with Northern European ancestry have the common form of red-green color blindness.